Records are made to be broken, and Millennium girls soccer fans at the program’s annual Sell Out Night exceeded last year’s crowd. An official count of 2,305 fans attended, compared to 2,235 in 2018. For the Tigers (15-1-1), their 3-2 win over district and region opponent Verrado High School will keep the chatter going. Millennium junior Anacel Valenzuela-Acosta scored the game-deciding goal for with around six minutes left, edging a Verrado (9-8) team that gave the Tigers all they could handle. Verrado scored early in the first half, then kept Millennium at bay until the 37th minute, when senior Kiana Miyazato tied the game at 1. Two Tigers went down in roughly the same area in the first half, but Coach Cameron said both would be okay. One of them was lifted off the field by two staffers. Players also attributed the slow start to some nerves playing in front of a crowd they hope broke its attendance record. 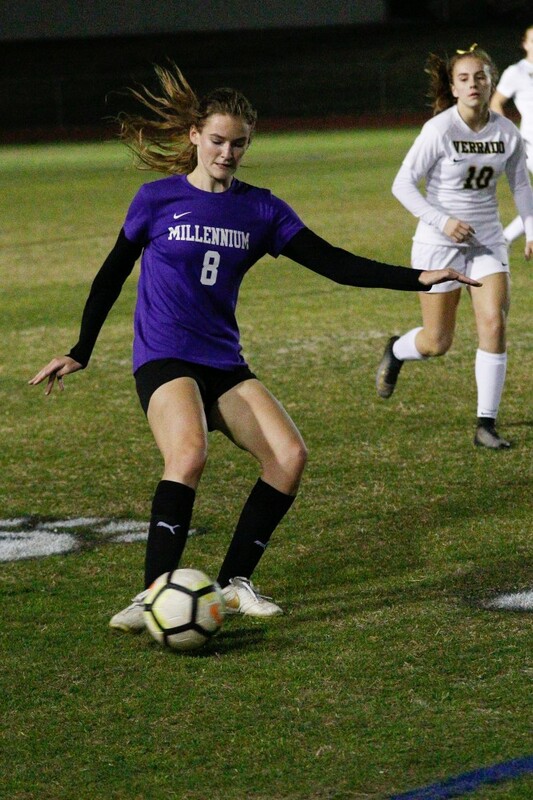 The Tigers took command in the second half, with sophomore Anne Marie Murphy scoring in the 56th minute after several shot attempts by Millennium either went over the goal or were saved by the Vipers goalkeeper. Verrado didn’t stay down for long, tying the game 2-2 off a long kick in the 64th minute. The Tigers, looking to prevent overtime, had two shot attempts from senior Selena Leon and junior Karis Stull fail. But with six minutes left in the game, Valenzuela-Acosta took a free kick from well over 20 yards and knocked it above the goalkeeper and just below the top bar of the goal to push the Tigers ahead 3-2. Millennium defended well enough to keep the score that way in the final minutes and end Senior Night with the win. Thursday’s game was Senior Night, but the Tigers still have Independence at home to end the regular season. Kirker and Miyazato said they will surely be visiting while in college. The two will be playing ball at Northern Arizona University. “It’s just incredible what we’ve done these past four years and how the team has developed and how we’re at this point now,” Miyazato said. The seven seniors recognized at halftime are taking their athletic and/or academic talents around Arizona. In addition to the NAU-bound players, Trinity Manuelito will be studying electrical engineering at the Massachusetts Institute of Technology. Two others will be attending the University of Arizona and Estrella Mountain Community College. “I’m gonna miss it,” Coach Cameron said about his seniors. “This senior class has been with me for four years, the four years I’ve been here. They started with us when we were getting crushed. Year 1 we just got destroyed. I think we won 3 games and now we’re winning 17 games a year. Tallying the attendance is no easy task. The soccer and athletics staff combines numbers for the junior varsity and varsity games, and also match up the ticket count with video taken at the main entrance to the field. Millennium hopes to move closer to nailing down the 5A Desert West region title when it plays at Agua Fria Jan. 29.